BOSTON - Freshman Mia Brown scored the overtime winner to send the No. 5 Northeastern women's hockey team (12-1-2, 11-0-2 WHEA) to a dramatic 5-4 victory over No. 4 Boston College (12-4-0, 9-2-0 WHEA) on Tuesday evening at Matthews Arena. In a see-saw game, the Huskies trailed 2-0 after one, led 3-2 after two, and trailed 4-3 into the final minutes of regulation before freshman Chloe Aurard knotted the scoreline at four with 1:21 remaining in the third. Brown then won it at 2:40 of overtime when she took a Brooke Hobson pass and fired a shot over the shoulder of BC netminder Maddy McArthur (28 saves) to give NU its first home win over the Eagles since 2013. Sophomore Aerin Frankel made a career-high 46 saves for Northeastern, including a breakaway stop on BC's Caitrin Lonergan with 10 seconds left in the third period. Freshman Alina Mueller powered the Huskies with two goals and an assist to extend her point-streak to 14 straight games. Aurard (goal, assist), Hobson (two assists), Brown (goal, assist) and sophomore Veronika Pettey (two assists) each recorded multi-point efforts, and senior Kasidy Anderson also lit the lamp. 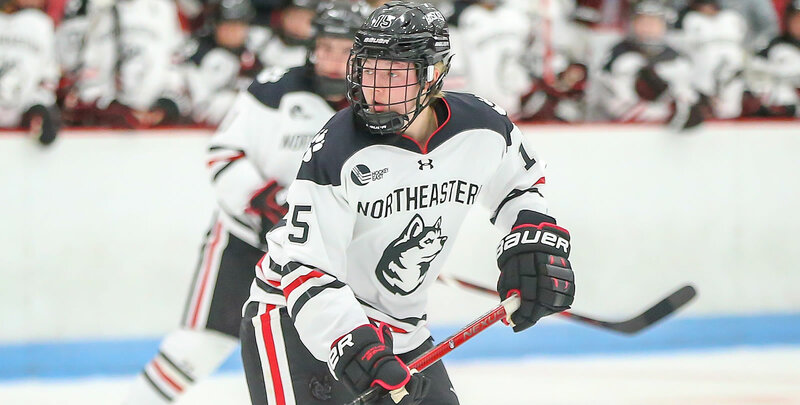 With the win, Northeastern extended its unbeaten streak to 12 straight games (11-0-1) and improved to 3-1-0 on the year against ranked opponents. The Huskies will close out the first half of the season this weekend with a home-and-home series against Holy Cross.